Diversity provides great strength and serves as a significant advantage to any culture or entity. As part of RIT, Saunders College is at the center of a university that delivers significant global, cultural and academic diversity. The International Student Services Office is the hub for a campus with students of all cultures and backgrounds, from 50 states and more than 100 countries find that RIT offers an exciting environment for intellectual and personal development. At RIT you are part of a student body consisting of approximately 2,700 international students, with an additional 1,900 students enrolled at RIT’s four international campuses. The RIT English Language Center as well as with Rochester Global Connections offer additional resources to the global community at RIT. In addition to our global diversity, nearly 3,300 RIT students from diverse racial and ethnic backgrounds are enrolled on our main RIT Rochester campus. The RIT Division of Diversity and Inclusion is committed to diversity through a mission to foster living, learning, and working environments that support and incorporate principles of equity, diversity, inclusion, and community. We have it. You get it. Large universities can offer a diversity of academic programs and RIT is no exception with many internationally recognized programs across nine RIT colleges. 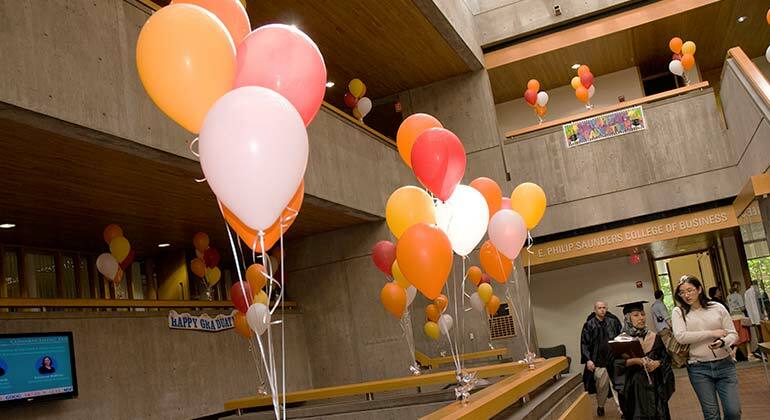 What makes your experience at Saunders College unique is that at RIT you get unparalleled access through a flexible and dynamic curriculum. This commitment to multidisciplinary studies allows student to use MBA joint-concentrations and electives to take courses in any college on campus. In addition, our 200+ student clubs and entrepreneurship competitions and activities put you in direct access to students and expertise in your fields of interest across campus, outside of business.